Shark Lift-Away 5-in-1 Steam Mop Review (model S3901): Is it any good? We like: Dual steam mop and handheld cleaner functionality with all the attachments you’re likely to need. 3 different steam settings. Long power cord. Easy to assemble. Not so good: Small tank capacity means more topping up. Cheaper models available. Our verdict: A real “no nonsense” steam cleaner that performs very well at all household steam cleaning tasks. The Shark Lift Away is a popular and highly rated steam mop & cleaner and it’s not hard to see why. 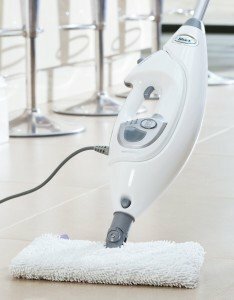 At £150 retail price (around £120 discounted) it’s certainly one of the more expensive steam mops available. So how does it compare with steam cleaners such as the cheaper Morphy Richards 9-in-1? Find out in our Shark S3901 review. The Shark S3901 is both a floor and handheld cleaner, with the water tank and controls housed within the detachable handheld steam cleaner unit. The floor cleaner is undoubtedly one of the best on the market; it is sturdy, well built and lightweight. The swivel head makes it easy to manoeuvre and can get into awkward spaces. It has double sided steam pockets enabling you to clean an area twice as much as usual. The pads are re-usable and can be washed in a machine and when they finally need replacing a pack of 3 will cost about RRP £7.99 making the total costs of the Shark 5 in 1 steam mop & cleaner very competitive in the long run. The Shark S3901 steam mop will also rejuvenate carpets and rugs with the included carpet glider but it is worth mentioning that it is not a carpet cleaner and is more for “refreshing” carpets and rugs. Both the floor steam mop and handheld cleaner have 3 settings: mop, scrub and dust with the scrubbing action being the most efficient at removing stubborn stains. There is a 7 metre power cord so unplugging and plugging in again is unlikely in most residential settings. The handheld cleaner, whilst not as efficient as some of the more expensive dedicated handheld cleaners, still does a very effective job. 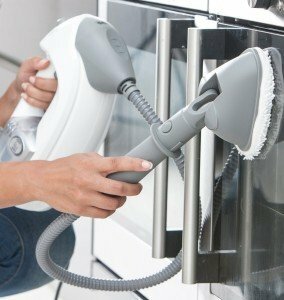 It has a variety of attachments including direct steam nozzle, a flat surface scrubbing tool, a 1m accessory hose. A great selling point is it cleans grease from kitchen tiles and the oven like a dream. Upholstery, curtains and clothes can also be cleaned with the handheld unit’s garment & upholstery attachments. This unit can also make cleaning windows, doors and conservatories a much quicker task. There are a couple to consider when looking at the Shark Lift Away steam mop. In order for the unit to be lightweight it has a small tank so filling it more than once will be necessary if you are in serious cleaning mode! If it’s to whizz around the kitchen or downstairs floors then the tank should be ample (approximately 15-20 minutes per fill). The manufacturers also recommend using filtered water to prolong the life of the cleaner. If you don’t have a filter then tap water can be used with the life span in mind or boil a kettle. Alternatively reusable crystals can be purchased to clean the water before filling the tank.